Climate One is a terrific talk show/public forum/podcast focusing on all things climate change, and I had the great opportunity to join some very smart people to discuss philanthropy’s influence on climate action. It felt like we only scratched the surface, but also covered a ton of ground on this important topic. Highly recommend the podcast, or if you’re in the Bay Area, drop in for one of their events. Fighting climate change isn’t cheap. Where’s the money coming from? Major philanthropic organizations like Hewlett and Bloomberg are at the forefront of addressing climate change, but could smaller funders be more in touch with grassroots needs? Are big donors out of touch – or just stretched too far? Where is the money coming from, where is it going, what are the biggest wins and what missteps are being made along the way? 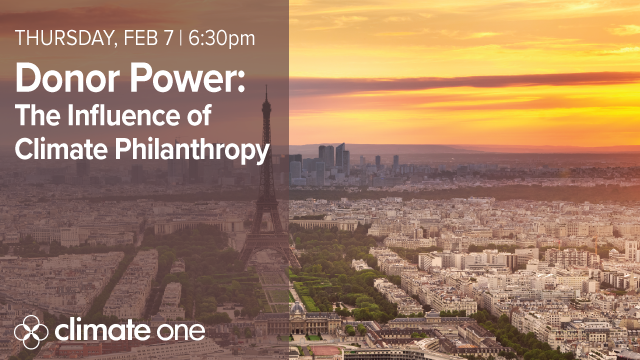 Greg Dalton is joined by donors big and small for a discussion on harnessing the power of the purse in the fight against climate change. You can listen to a podcast of the two panel discussion here. Watch the full streamed video of the live event here.